We chose the following Top 10 Colorful Winter Landscape Plants based upon several factors: winter color being the most important, then overall performance ratings in the landscape based upon our own experience with these plants and the feedback from many other gardeners. We hope you enjoy this article and that it helps you find the perfect plant for your winter garden! The Dwarf Burfordi Holly is a very nice small to medium sized shrub or small tree with very shiny, deep green foliage. After blooming in spring, it produces large numbers of berries that turn brilliant red in fall and persist through winter. The fruit not only catches the eye but is known to attract an assortment of birds. You can prune or shear Dwarf Burfordi to maintain most any shape desired: a rounded shrub, as a formal or informal hedge, or limbed up to form a very attractive small tree that is perfect as a focal point or specimen in the landscape. I like it best as a multi-trunk tree. Dwarf Burfordi Holly is a self-pollinating holly - there are no male/female clones to worry about. There is debate among horticulturists and gardeners as to whether this holly is actually a "dwarf" plant. Based upon it's mature height of 6 to 10 feet, and it's parent Burfordi Holly growing to 20 feet or more in height, I would say it's a dwarf. Prefers full to partial sun and is not to fussy about soil as long as they are fairly well-drained. Hardy in Zones 7 to 9. 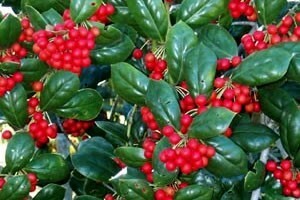 Find out more about the Dwarf Burdordi Holly and buy it here. 'Firepower' Dwarf Nandina is an impossibly bright compact evergreen with lime green new leaves through the warm season and superior fire red color in the fall and winter. It is the consummate accent for Asian-inspired gardens or for shady or sunny landscapes in need of color. You can plant Firepower in small clusters in smaller spaces, or in large groupings to add an eye-catching splash of color in larger spaces. Firepower can also be planted as a single specimen in smaller gardens and courtyards, where its color provides a focal point or accent. It is perfect as a lacy overhang that won't block sunlight to water gardens, pools and fountains. It is ideal plant for spas in small urban backyard gardens, and may also be planted in container gardens. Firepower isn't too fussy about soil type but this plant hates wet feet! Make sure to plant it where the soil is well-drained, preferably on sloped ground or in raised beds where moisture is a problem. Hardy in Zones 6 to 11. 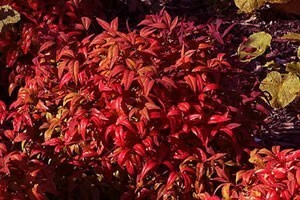 Find out more about Firepower Dwarf Nandina and buy it here. The Golden Dwarf Sweet Flag looks like a grass or small iris, but is actually a member of the arum family (Calla lily and Jack-in-the-pulpit). It is easily grown in average soil, or wet soils in either full sun or part shade, however appreciates some relief from hot summer sun when grown in southern climates. Here in mid-Georgia, I plant it in shade or morning sun with afternoon shade. The variegated leaf blades are one-quarter inch wide and are striped with yellow and green but primarily appear as yellow. Whether planted in small clusters or large mass plantings in garden beds, or in container gardens, the colorful evergreen leaves add wonderful contrast throughout the year. I have it growing in my garden pond and also in garden beds. 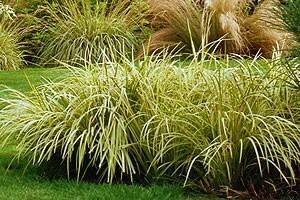 Like Variegated Liriope (Monkeygrass), this cultivar slowly naturalizes by spreading roots, forming attractive soft-textured mounds, but is not invasive. Mature height will be 12 inches or so with an eighteen inch or so spread. Evergreen in warm winter climates. Useful in container gardens, for edging and as a groundcover. Great for erosion control along the banks of streams and ponds. Hardy in USDA Zones 6 to 9, and into parts of Zone 5 with protection. Find out more about 'Ogon' Golden Dwarf Sweet Flag and buy it here. Blush Pink Dwarf Nandina is an exciting new version of Nandina ‘Firepower.’ Stunning pink new growth sets Blush Pink apart from its rivals. The pink color glows throughout the active growth season leading up to a spectacular fall and winter display of bright pink and red foliage. The foliage always appears very soft, providing a unique texture in the landscape as well as outstanding year round color. As the pink new growth matures they become darker pink then green but remain softly textured. Like it’s closest relative, Fire Power, Blush Pink Nandina prefers full sun to part shade but has more color with more sun. Because of its smaller size (18-24" x 18-24") and unique texture, Blush Pink makes an excellent short hedge in front of dark green taller shrubs or can be planted in small to large groups for a patch of eye catching. Plant in well drained soil as dwarf nandina hates wet feet. If you want year round color in your landscape, Blush Pink is one of those "must have" plants. Hardy in Zones 6 to 10. 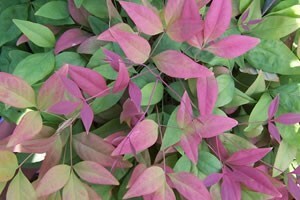 Find out more about Blush Pink Dwarf Nandina and buy it here. One of the first signs of spring is the gorgeous yellow flowers of the Spring Glory Forsythia, also known as "Yellow Bells." But, because it actually blooms in late winter in the South, this plant might have been better named "Winter Glory"? But then that might anger the folks in the North, where it blooms in early spring? This versatile flowering plant is a "must" in many gardens because of its mass display of intensely bright yellow flowers. It is valued as a source for cut flowers and use as a privacy screen, background landscape shrub, or addition to the flowering shrub border. When in bloom, the leafless branches are literally covered with golden yellow flowers from late January through March, depending on your location. During the months of December and January, the branches may be cut and forced into bloom for winter color indoors. After flowering, attractive bright green foliage quickly covers the stems. Forsythia grows and flowers best in full or partial sun. It has many uses in the garden. The plants are often used as a summer screen for privacy, as a specimen plant, or for espalier against a wall or fence. A must in every garden! Hardy in Zones 3 to 9. 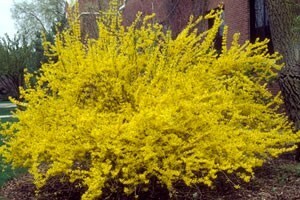 Find out more about Spring Glory Forsythia and buy it here. Go to next page to see the Top 5!